For the last 4 years, I have desperately wished for a universal KU hand signal. 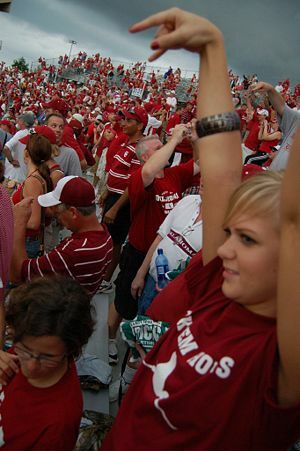 Texas, ND State, Utah and Oklahoma have all adopted a gesture for fans to easily show their team pride and help identify which team they ultimately support. Scenario: You’re a Texas fan and you’re driving down the highway. You see a Longhorns sticker on the back of a vehicle you’re about to pass, and you wish to show your team pride to the other driver without having to ask them to pull over or roll down a window and yell “hook ‘em”. All you have to do is flash the hand sign, wait for it to be returned, and continue with your life. New Scenario: You’re a Kansas fan and you’re driving down the highway. You see a Jayhawks sticker on the back of a vehicle you’re about to pass and you wish to show your team pride to the other driver just like the Texas fan before. What would you do? Roll down the window and yell “Rock Chalk” over the sound of the wind and other vehicles. Just ignore it and continue with your drive. Wave the Wheat and risk the other driver thinking that you’re about to crash. 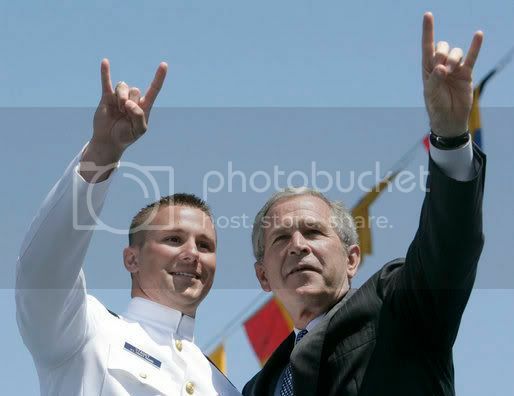 To me, all of the above options are just ridiculous, which is why the “Beak ‘em Hawks” hand signal should be adopted! Simply press all 4 fingers together and connect the thumb up to the index or middle finger and curve each finger just a little, somewhat making the symbol of a “beak”. Then proceed to make a motion much like a peck, a chicken would do. While this is not necessarily a review of an existing product or service, I am grading this on hopeful future use. 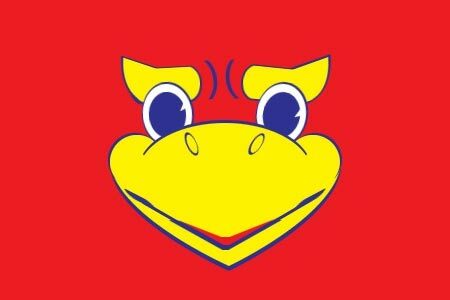 I have awarded 1 X for potential, 1 X for ease and convenience, 1 X because it’s the Jayhawks, and half an X because it can’t be reversed like the Texas symbol is by Oklahoma! 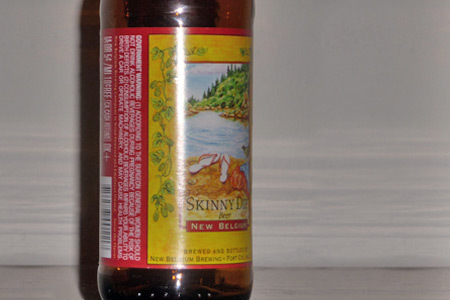 According to their website, New Belgium Brewing created Skinny Dip in an attempt to create a “highly drinkable beer for after workouts.” Since I’m fairly well known for my prowess at the gym, as well as my love for completely negating my workout by pumping beer into my stomach after pumping iron, I had a positive impression of Skinny Dip before I’d even taken my first sip! As it turns out, New Belgium offers an assortment of beers. You may be familiar with their most popular product, an amber ale dubbed Fat Tire. While there is nothing wrong with drinking their flagship brew 365 days a year, Skinny Dip maintains an important niche as their seasonal summer offering. It’s easy to tell this beer apart from the rest on the first taste – it really brings to mind a summer afternoon or evening! I noticed an initial citrus, almost tangy-like flavor followed by a crisp finish. The taste of hops was definitely noticeable, but not overwhelming and not enough to make the beer overly bitter. It was light enough to quench my post-workout thirst while not filling me up too fast. While I am no beer expert (evidenced by the lax use of ‘beer-tasting’ terms in the previous paragraph), I hear there are three things that matter most to a beer: the initial taste, the ‘body’ of the beer, and the finish. In my opinion, Skinny Dip balances the three very well. In fact, the only drawback about this beer is the fact that after it’s gone, you have to wait until the following summer to buy it again! Everything about Skinny dip — from the provocative picture on the front of the label, to the crisp finish — makes for a delightful combination that I would recommend to everyone! First-time beer drinkers (of legal age, of course), to well-seasoned connoisseurs alike! If there’s one thing I cannot get enough of, it’s stalking my favorite athlete’s every move. Thanks to Twitter, I am able to do this from the comfort of my own home. There are many different types of “Athlete Tweeters” out there. Some post excessively, some offer insight into a professional athlete’s life, and then there are some that are just simply dull. Blake Griffin is somewhere in between the 2nd and 3rd categories. Occasionally, his posts are definitely worth the 4 seconds it takes to read the 100 to 140 characters. Unfortunately, other posts are like watching an episode of Cheaters, only instead of the guy cheating, he really does go to a weekly bowling league just like he said. Although his tweets may not be what I had expected, some are entertaining and funny enough to keep him on my following list. One post that made me laugh was “I mean we talkin bout practice… Not a game, practice…” in reference to the Rich Rodriguez and the Michigan situation. He also congratulated (brother) Taylor Griffin on receiving a contract from the Suns, and let everyone know that he got to throw out the first pitch at a Dodgers game – both quality tweets. 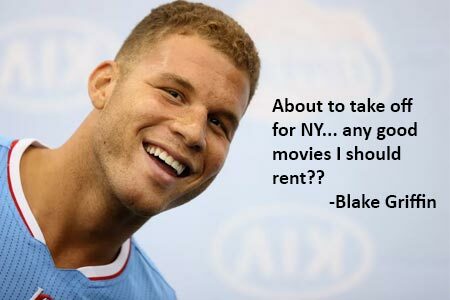 I was going to go with 2.5 X‘s for blakegriffin, but some “Athlete Tweeters” out there have set the bar so extremely low (I am looking at you Ochocinco and Dwight Howard), I settled with 3. There’s a reason grocery and retail stores put gum next to the checkout isle. No one actually goes shopping for it, but it’s really hard to resist hours of chewing fun at only $0.99 for a pack of 14 pieces (roughly 7.5 cents per piece after tax). One thing is for sure. This stuff isn’t your grandma’s Double Bubble that’s been sitting in her living room since you were in kindergarten and seems to crack a molar every time you bite into it. On the contrary, biting into Stride is satisfyingly soft. Truth be told, I’m not sure what winterblue is supposed to take like. There’s no real precedence for flavor like there is for berry, or watermelon, or even bubble gum. Is it supposed to taste like wintergreen, with just a bit more of an edge? 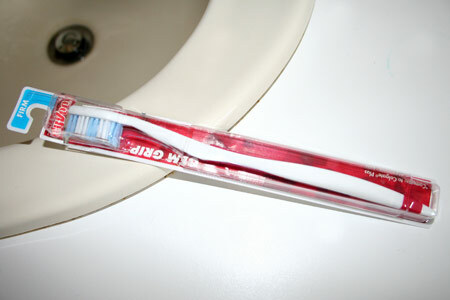 Regardless, it is one of the longer lasting gums I’ve ever had. 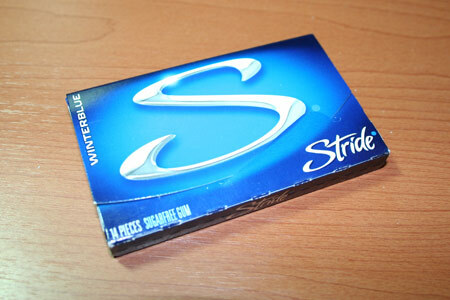 I mean, I’m no Violet Beauregard from Willy Wonka, but I do enjoy chewing my gum longer than most people. In fact, if I were qualified to give this a J.D. Power and Associates ‘Longest Lasting Gum Without Losing Its Flavor’ award, I would have done it two paragraphs ago.